FC Halifax Town suffered their 10th defeat of the season as they were outplayed in a 3-0 defeat at home to Woking. At least their previous home humbling came at the hands of one of the league’s high-flyers in Cheltenham, but this was against a team with just one win in seven games who’d lost four in a row. 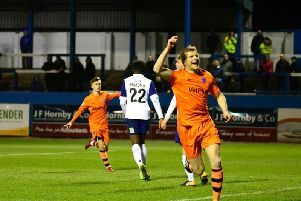 As has been the case all season, Halifax took two steps back after taking one step forward, and followed their welcome win on Tuesday night with another day to forget in front of their own fans. The hope of Town’s first back-to-back wins since February proved fanciful as a brace from Dan Holman and one from John Goddard eased Woking to victory. Momentum hasn’t been a word that’s figured too much in Town’s vocabulary this season, and typically of this term, any that had been built up at Altrincham was erased with a slow start here. Woking belied their awful form of four defeats on the bounce with a bright opening 10 minutes, which was capped with Holman tapping-in unmarked at the far post from Kadell Daniel’s cross as The Cards scored the opening goal in a game for the first time in just under a month. Make that 24 games without a clean sheet; on this evidence, Grimsby should make it 25 on Tuesday. Woking established their early superiority with some runs forward by the adventurous left-back Chris Arthur, and the man ahead of him on the left, John Goddard. Arthur surged at Kevin Roberts soon after Holman’s goal before firing just over the angle of post and bar in a move that highlighted Woking’s positive approach and Halifax’s hesitancy. Town were full of commitment at Altrincham, launching into tackles and hungry for the ball. But they regressed back to the timid and tentative side that had looked so vulnerable against the likes of Torquay, Aldershot and Southport. Any Bradford, Leeds or Huddersfield fans here on Non-League Day may have been pondering the merits of a trip to the White Rose Centre instead. Further shots at goal from Goddard and Kieran Murtagh brought saves from Matt Glennon as Woking continued to overwhelm their hosts, who had yet to register a shot until Shaun Tuton dragged his effort wide from 25 yards after 26 minutes. It said much that Julian Banton was Town’s best player by the half-hour mark, again impressing with a mixture of brute strength and controlled aggression. The same couldn’t be said of his team-mates though, who lacked any bite in the tackle or the same urgency going forward as the visitors, while Hamza Bencherif and Jordan Burrow were outfought in the air by Woking’s imposing centre-backs Brian Saah and Terrell Thomas. Midfielder Kieran Sadlier, making his debut after joining on loan from Peterborough, produced a rasping drive from just shy of 30 yards out which was parried straight to Burrow, but he scuffed his rebound, which bobbled apologetically wide. That was after a quick free-kick caught Town napping and allowed Goddard to run into the box before his driven shot was saved, with Glennon’s workload already similar to that of a week ago. He could only watch and hope though as Holman’s turn and shot rolled inches wide soon afterwards. Only Torquay had conceded more home goals in the league than Halifax, but that statistic looked under serious threat. Excellent persistence from Tuton saw him battle his way into the box before his goalbound shot was superbly blocked by the diving Saah. From the corner, the action swung the other way as Holman got the better of the back-pedalling Roberts before his shot on target was blocked by Kingsley James. Town had improved by half-time, but still looked so vulnerable at the back as the two sides traded chances. Glennon remained too busy after the restart with a superb double-save to stop Daniel’s shot then Murtagh’s follow-up after a sloppy pass by Scott McManus. The direct route still wasn’t working for Town as any high balls were lapped up by the Woking defence, while the pace and trickery of Daniel and Holman proved difficult to contain. Darren Kelly only waited until 10 minutes after the break before a double change, which saw CJ Hamilton make his first appearance since the 2-2 draw with Southport last month. But Town were only keeping Woking within touching distance literally by their fingertips, thanks to Glennon’s superb save from Mark Ricketts’ long-range pile-driver. A deserved second did arrive though when Goddard skilfully curled his free-kick around the wall and out of Glennon’s reach. There were echoes of Cheltenham two minutes later when Town failed to react to a loose ball 30 yards out, with only Holman alive to it as he curled a sumptuous shot beyond Glennon. A wayward cross straight to keeper Jake Cole prompted a few boos from the South Stand before Holman turned Roberts one way and the other before Glennon parried his low shot across goal. It was now a vicious circle of groans from the crowd leading to sloppy play from Halifax, leading to more groans from the crowd. Was Altrincham really only four days ago? And this was Woking deprived of their injured star striker Scott Rendell, who bagged 24 goals last season; with him, and without Glennon, it could have been Cheltenham all over again. Halifax: Glennon, Bolton, Banton, Brown, K Roberts, Bencherif (Macdonald 87), Sadlier, James, McManus (Hamilton 55), Burrow, Tuton (Hughes 55). Subs not used: Porter, Brooks. Woking: Cole, Caprice, Ricketts (Poku 85), Saah, Arthur, Jones, Murtagh (Keohane 87), Thomas, Goddard, Daniel, Holman (Sole 68). Subs not used: Andrade, Hamann.